IX.1.22 Pompeii. 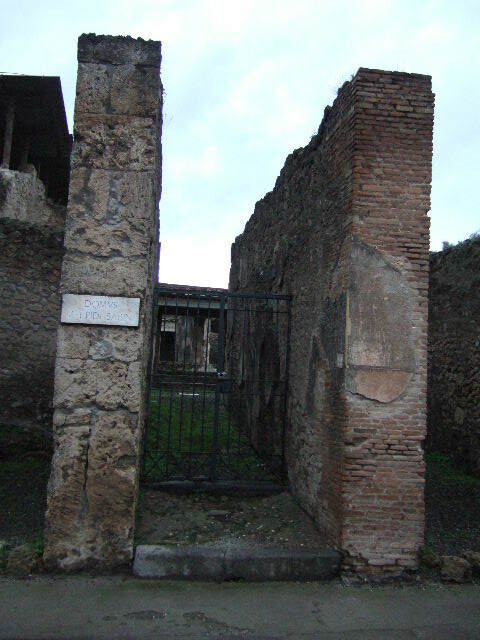 House of M. Epidi Sabini. Linked to IX.1.29. 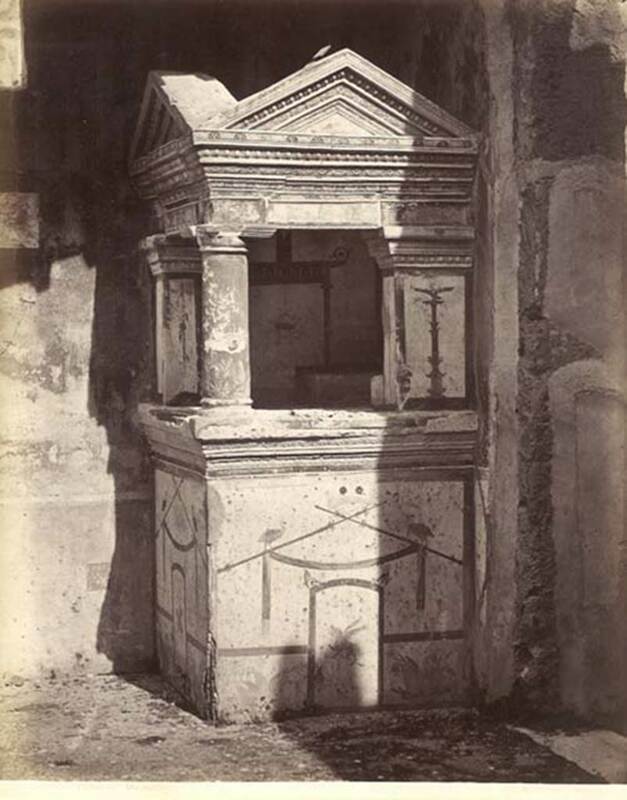 Excavated 1858 and 1866. Restored 1985. IX.1.22 Pompeii. December 2005. Entrance, in the middle. IX.1.22 Pompeii. December 2004. Entrance. 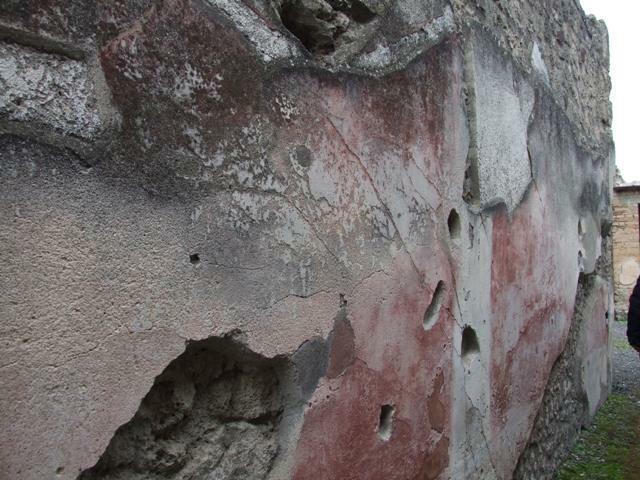 IX.1.22 Pompeii. December 2004. Vestibule, looking north along entrance corridor to atrium. IX.1.22 Pompeii. December 2006. Vestibule wall, on west side. IX.1.22 Pompeii. December 2007. 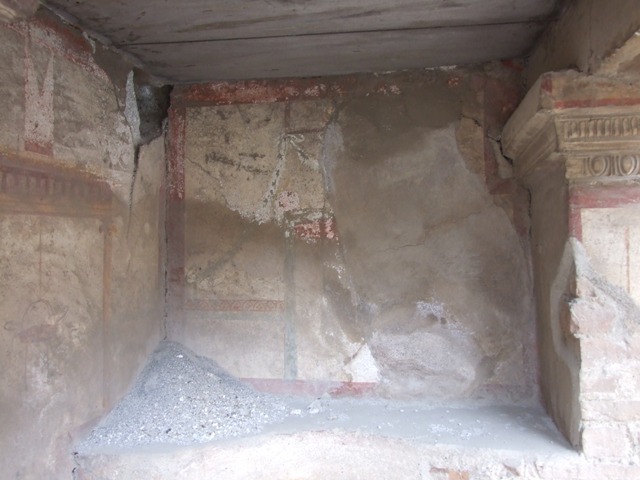 Room 2, west wall of fauces or entrance corridor. 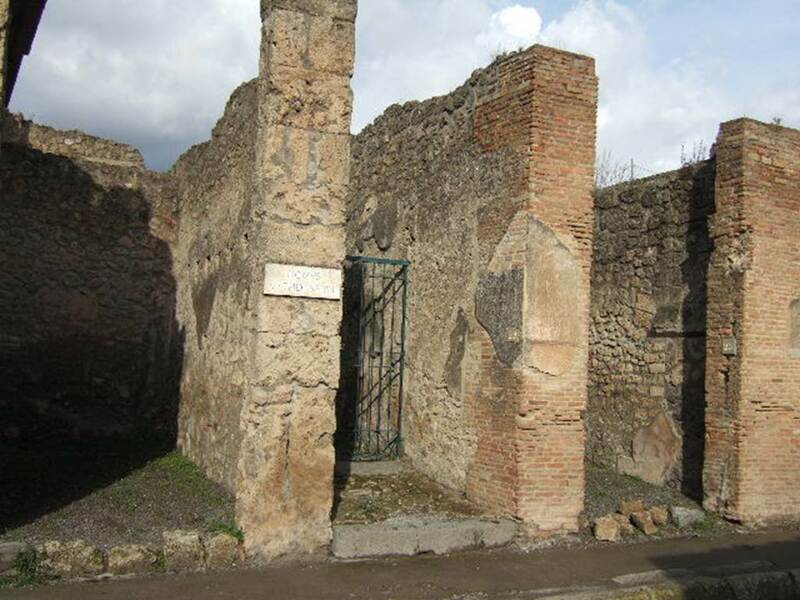 IX.1.22 Pompeii. December 2007. 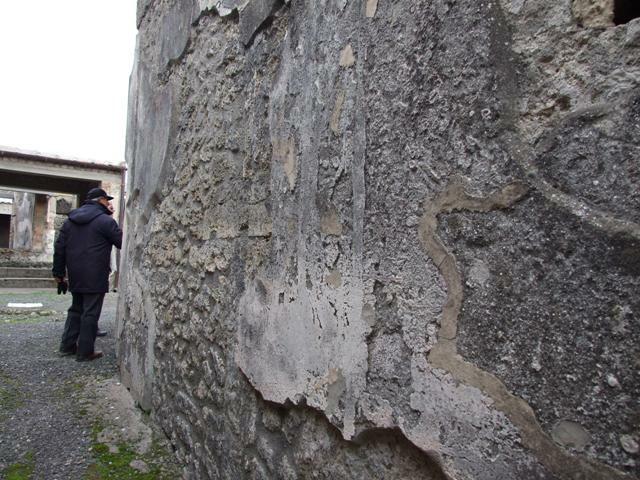 Room 2, east wall of fauces. IX.1.22 Pompeii. December 2007. Room 1, atrium. Looking north. 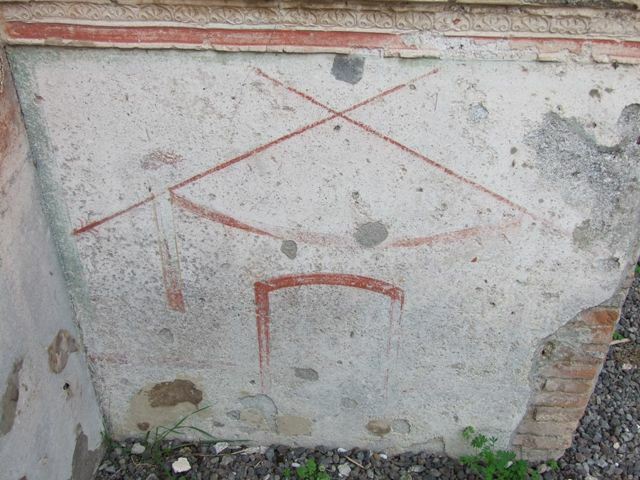 IX.1.22 Pompeii. December 2007. Room 1, atrium with household shrine in south-east corner. 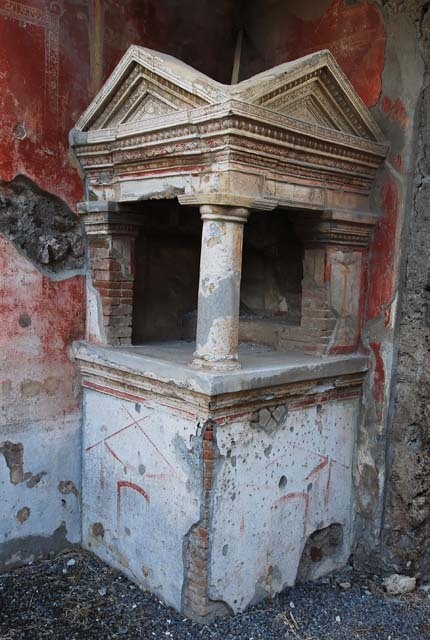 According to Boyce, on the top of a high masonry podium stood the elaborately decorated aedicula. 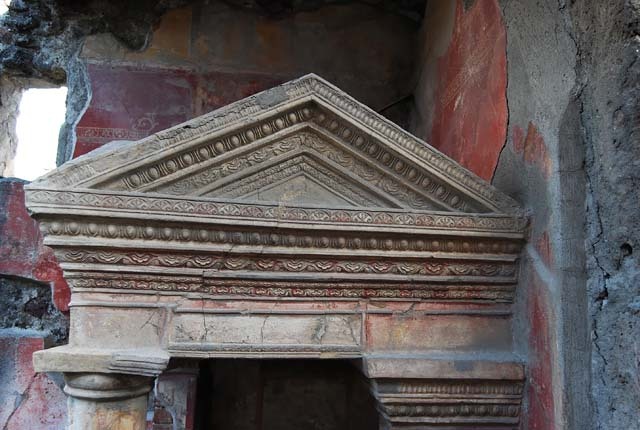 The podium was decorated along the upper edge with a double band of painted stucco relief. 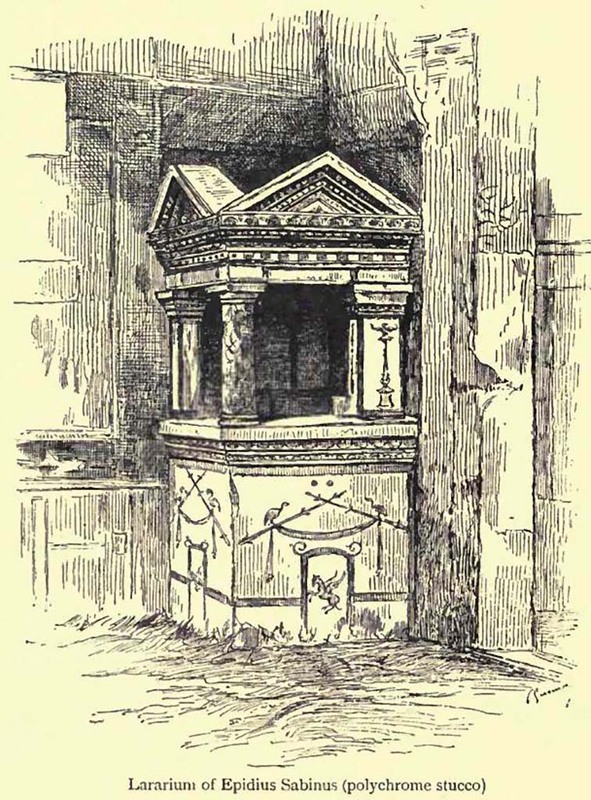 There was one Doric column of heavy proportions with base and two rectangular pilasters attached to the room walls. These supported heavy entablature and cornice and a roof with two pediments. 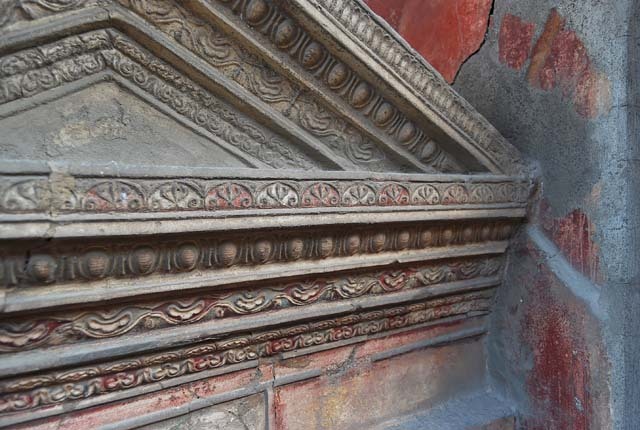 The cornices which surrounded the pediments were decorated with quadruple bands of red and blue stucco relief. 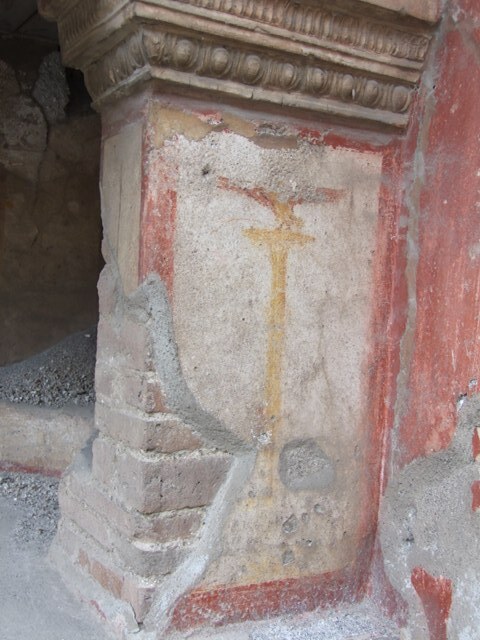 The single column was also stucco coated and painted to imitate red and yellow marble. The walls, inside and out, were painted with decorations in red, green and yellow upon the white background; ornate portals, garlands, birds, candelabra and arabesques. Against the walls within the shrine was a low step, to serve as a pedestal for the figures of the gods. 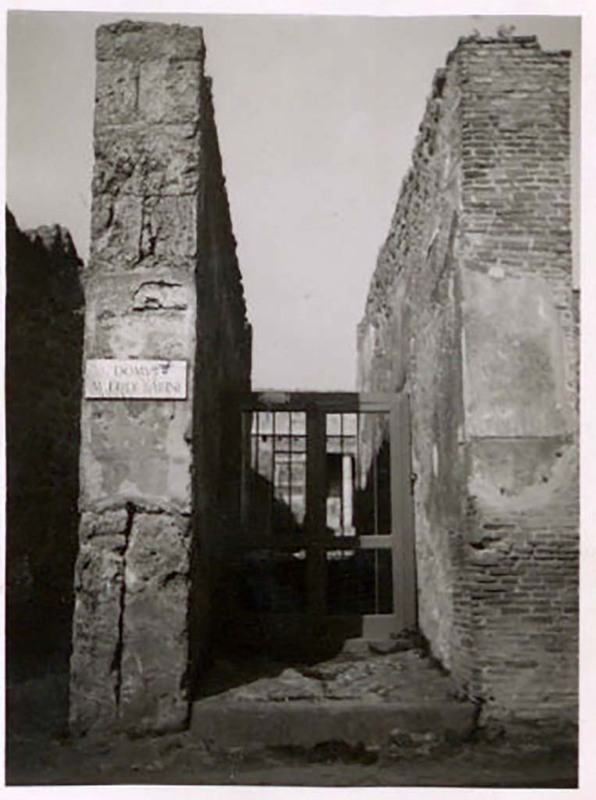 IX.1.22 Pompeii. November 2008. Room 1, atrium with household shrine in south-east corner. 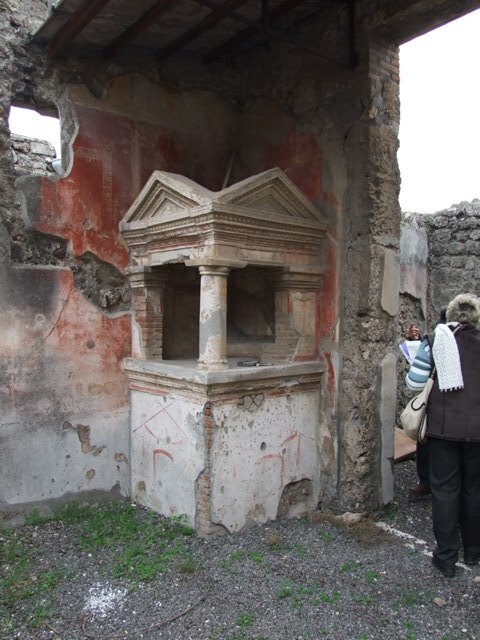 IX.1.22 Pompeii. 1968. Room 1, atrium with household shrine in south-east corner. 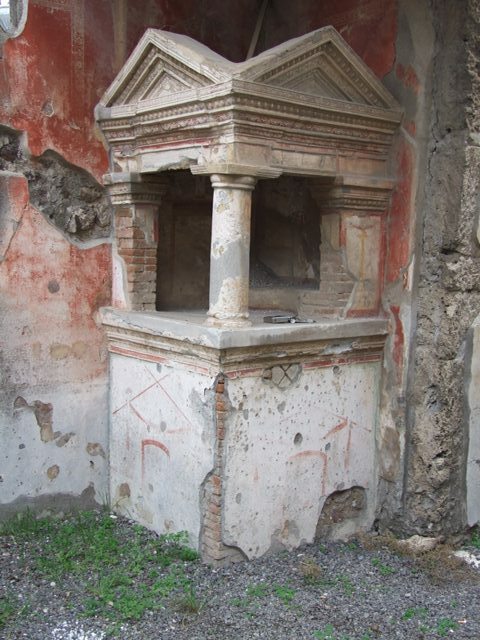 IX.1.22 Pompeii. c.1880-1890. G. Sommer no. 9205. Room 1, atrium with household shrine in south-east corner. IX.1.22 Pompeii. December 2007. Room 1, atrium. Top of household shrine in south-east corner. IX.1.22 Pompeii. November 2008. 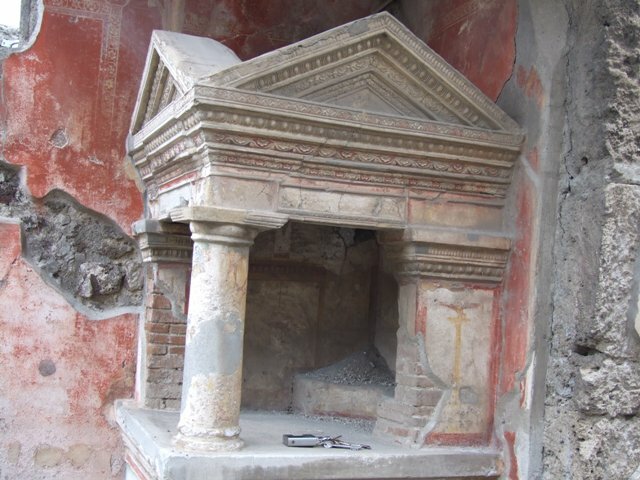 Detail from west side of lararium. Photo courtesy of Nicolas Monteix. 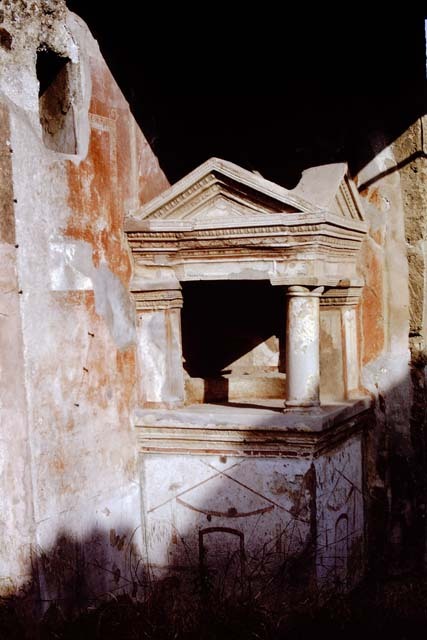 IX.1.22 Pompeii. November 2008. 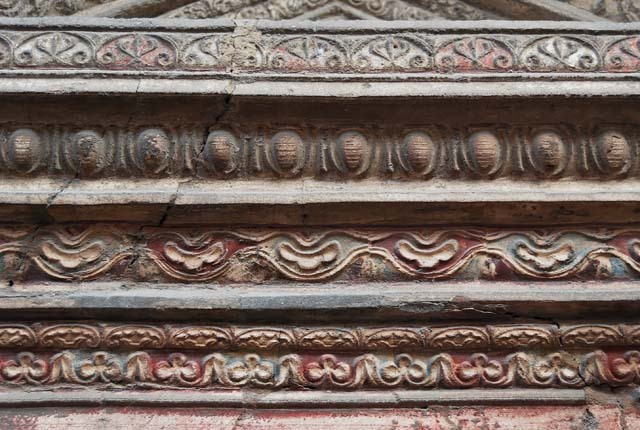 Detail of stucco from lararium. Photo courtesy of Nicolas Monteix. 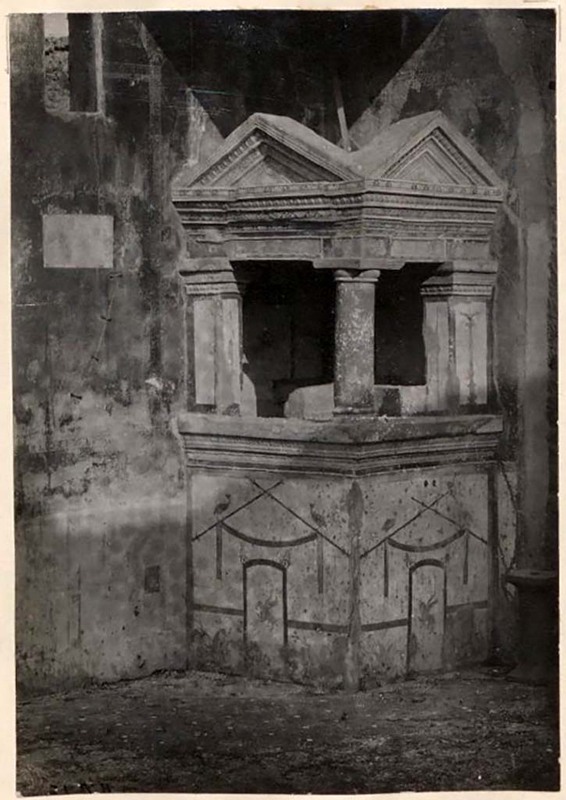 IX.1.22 Pompeii. November 2008. 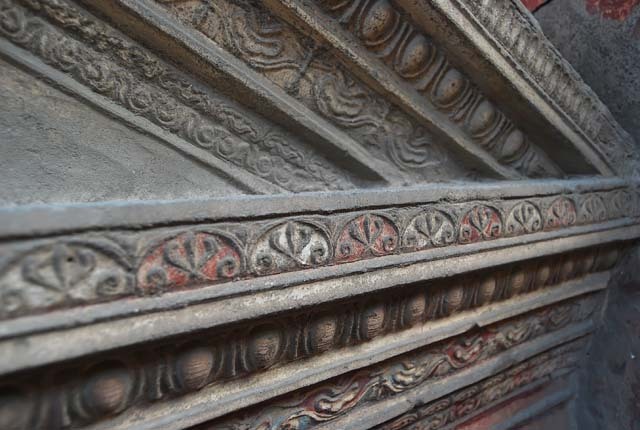 Detail from lararium. Photo courtesy of Nicolas Monteix. IX.1.22 Pompeii. December 2007. Room 1, atrium. Household shrine in south-east corner with painting of a bird. IX.1.22 Pompeii. November 2008. Room 1, atrium. Looking east at west side of household shrine, with painting of a bird. IX.1.22 Pompeii. December 2007. Room 1, atrium. Painting on east wall of household shrine in south-east corner. IX.1.22 Pompeii. December 2007. Room 1, atrium. 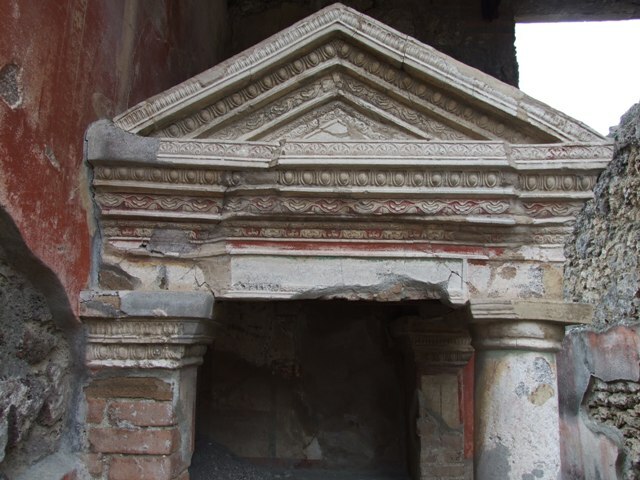 Looking south at ornate top pediment of household shrine in south-east corner. IX.1.22 Pompeii. December 2007. Room 1, atrium. Painting from south wall of the inside of household shrine. IX.1.22 Pompeii. December 2007. Room 1, atrium. Painting on base of household shrine in south-east corner. IX.1.22 Pompeii. 1968. Room 1, atrium. Top of household shrine in south-east corner. IX.1.22 Pompeii. December 2007. 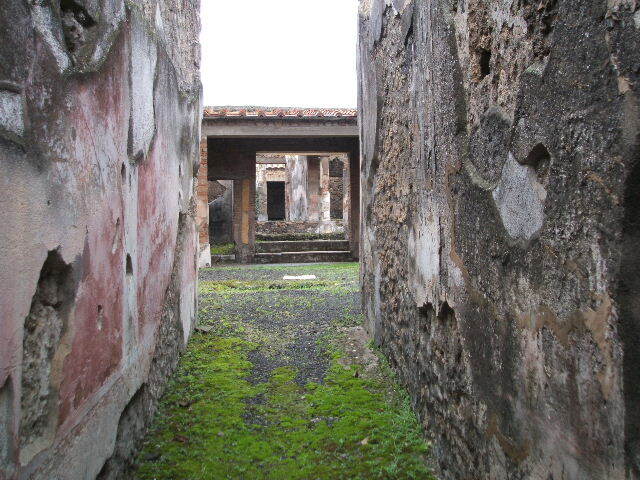 Room 3, cubiculum on east side of main entrance fauces, looking south. 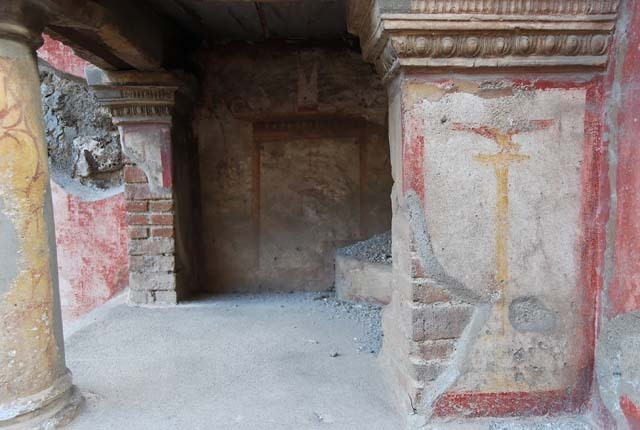 According to Bragantini etc, the walls of this room were painted with a black dado decorated with plants. 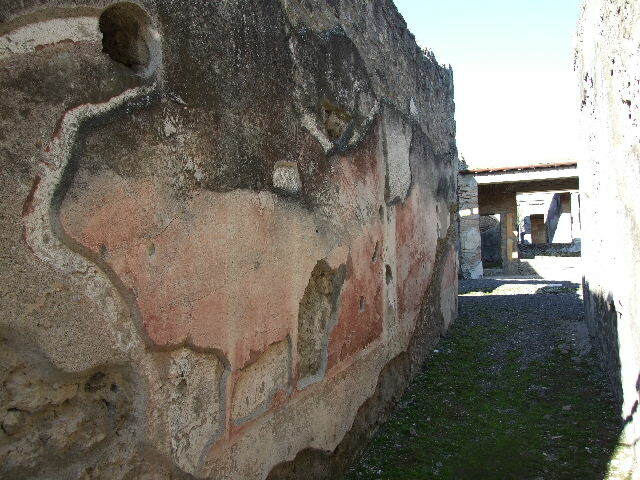 The middle zone was painted with red panels and the upper zone was faded. 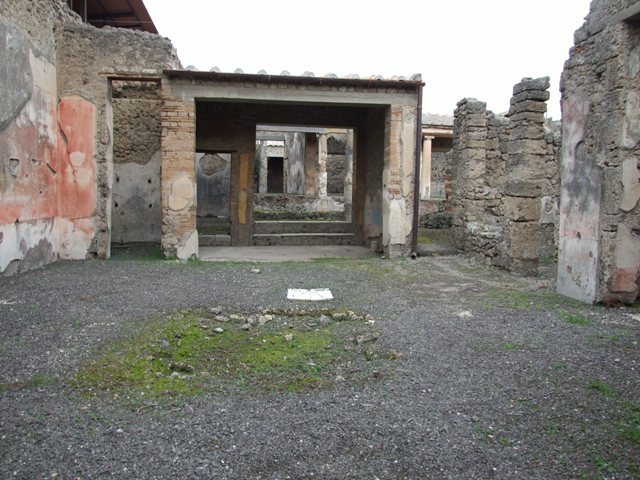 IX.1.22 Pompeii. December 2007. 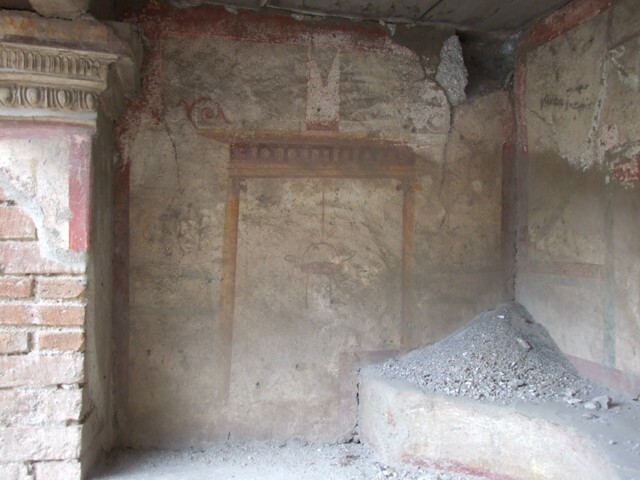 Room 3, looking towards south-east corner in cubiculum.